It comes as no surprise to those of us who watch these types of things on a regular basis, but The Daily Beast has a piece out today talking about how each of Graham's children is hoping to shape the legacy of their aging and ailing father. Also of no surprise, the article focuses most on Franklin Graham, as he has been the most outspoken and most in the public eye. And what of the criticism that Franklin, a Christian minister, takes political sides in a way that his father did not? Billy Graham formed friendships with many politicians, and had intimate (though complex) relationships with both Richard Nixon, a Republican, and Lyndon Johnson, a Democrat. Franklin’s political friendships lean hard to the right. Sadly, Franklin, who has said that Islam is “wicked and evil,” will probably win the day. 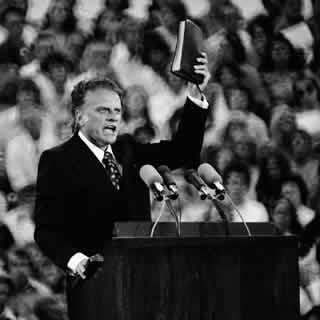 I still hold out hope, though, that those who really want to learn the legacy of Billy Graham will do more than vaguely remember a sermon that once heard him preach or listen to anything his son says about him, but will instead read about the man who's theology was much less neat than his sermons would have you believe and who read widely and voraciously, even that with which he often disagreed. I am no Graham evangelist by any account, but as I have moved away from my fundamentalist Christian background I have been able to see aspects of Graham that many conservative Christians want to keep hidden. It is sad that Graham's children are having to fight so hard over his legacy, but it is not surprising. I hope that in the end Graham's life will be able to speak for itself and will not be fed through a right-wing, fundamentalist Franklin Graham's mouth first. Does Morality Point to "Something Beyond"?